A sleek, slender mercury glass pillar is seated upon a polished nickel rectangular base and topped with a natural linen shade in this striking table lamp design. The luminous beauty of mercury glass is featured in this elegant table lamp design. The polished nickel finish base and accents complement the shine of the mercury glass pillar. A natural linen hardback shade adds texture to complete the look. 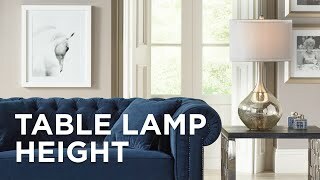 Singly or in pairs, this glass table lamp design from Thumprints enriches any room in the home. 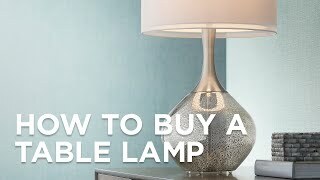 Pillar mercury glass table lamp. Polished nickel finish base and accents. Natural linen shallow hardback drum shade. Mercury glass and metal construction. Turn knob switch on socket. Base is 6 1/2" wide. 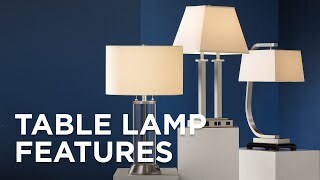 Add a touch of contemporary style to your home with this glass and iron table lamp featuring a polished nickel finish base and a white parchment lamp shade.